At Rebound, our goal is to get you back to what you enjoy doing! We stand behind our philosophy which embraces both empowering and educating our patients through reducing or eliminating pain, improving strength and coordination and preventing future injuries. Our physical therapists offer therapy for a wide range of services including; joint and muscle injuries, pre- and post-surgical rehabilitation, sports injury rehabilitation, balance and vestibular rehabilitation, aquatic therapy, massage therapy and women’s health. 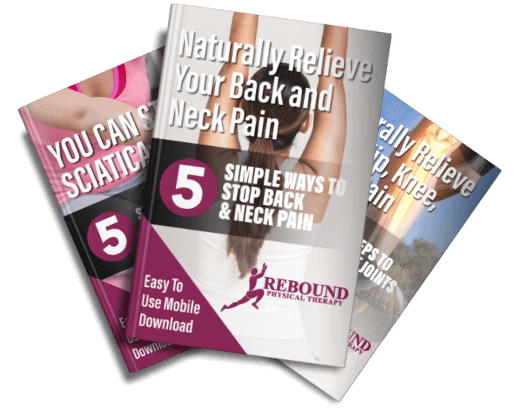 Rebound has played the MAJOR role in helping me regain my balance, ability to function and confidence to move normally after a sudden onset of vestibular neuritis. Long after resolution of the acute onset of symptoms, Rebound staff patiently and expertly led me through exercises to improve my ability to move and the improvement has been great! Take a tour of Rebound Physical Therapy clinics! Convenience and affordability go hand in hand. Rebound PT offers flexible appointment times designed to fit your busy schedule. We accept most major medical insurance - including auto insurance and Worker’s Compensation plans. Research has proven that physical therapy is effective for those who suffer from back pain or sciatica pain. It’s also safe. Post surgical rehab is vital to helping you regain your strength, balance, flexibility, and function. The goals of aquatic therapy include reducing stress, promoting relaxation, improving flexibility and more. Manual therapy is any form of hands-on treatment that is designed to help a part of the body function better. It incorporates a wide range of activities that help you regain or maintain your strength, flexibility, balance, endurance, or stability. Helping women resume an active lifestyle without restriction or pain. Smart Exercise is a personalized health management program. Vertigo is the feeling of a rocking or rotation when you are perfectly still.